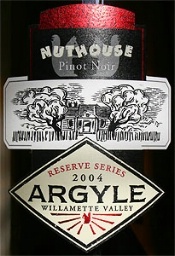 2004 Argyle Pinot Noir Nuthouse Reserve Series: Retail $60. I am in trouble. Big trouble. My wife left with one of the boys today to visit her parents and we are going to join them soon. Alone, watching March Madness, I ached for a Pinot. I decided to grab this one since it was past the Cellar Tracker drinking window (2013) and the last bottle was, well, ho-hum. This one wasn’t. By a long shot. Great from nose (blackberry and cassis), through the mid-palate (rich, deep, and profound), and on to the finish (Whoa), this was by far the best of the half-case I bought back in 2007. Whoa. And one more Whoa. Outstanding. Plus. 93-95 Points. 2010 Byron Chardonnay Santa Maria Valley: Retail $25. You know? This is fine, but it can’t really decide what it wants to be. It is part big Cali Chard with butter and oak on both the nose and the palate. But it also has decent acidity and structure on the back-end. So what to make of it? I am not quite sure. Is it “good”? I guess. Would I buy more? Probably not. A bit of a cry from the Ken Brown wines of yore…. Very Good. 86-88 Points. 2006 Castelluccio La Mia Riserva Forlì IGT: Retail $25. 100% Sangiovese. Nice nose, but a little stewed. On the palate, a bit of fruit, but quite austere and reserved. Plenty of acid to go around though, making this a good food wine. I paired this with some spaghetti and meatballs. Overall, not a bad match-up, but the wine could have used a bit more fruit as the sauce had a bit of sweetness to it. Very Good. 86-88 Points. 2005 Domaine du Chateau de Meursault Beaune: Retail $30. 100% Pinot Noir. I bought several of these years ago for $10/bottle. Yeah, $10. The first few were a bit harsh, but if this bottle is any indication, they have settled down considerably. Some faint red berries and cassis in the glass, with subtle even faint fruit on the palate, but nicely balanced. Overall, Very Good–a nice bottle of wine…. 88-90 Points. 2005 Domaine du Mas Blanc (Docteur Parcé) Collioure Clos du Moulin: Retail $25. I pretty much spell “Collioure” incorrectly every time I try, which is why I hesitate to ever write about it. lt is also very difficult to find on these shores, but I got these online several years ago and it is time to start popping them. Although not technically in the Rhône (it is just across the line in Roussillon), the wines are a classic Rhône-style GSM (Grenache, Syrah, Mourvèdre) blend. The last bottle I had of this was corked, but not here. Very nice red berry fruit (stopping just short of being “stewed”). Good acidity and an ample finish. Very Good, but no need to go out and do any cartwheels. 87-89 Points. The Mer Soleil bottle is the ceramic one on the left…. 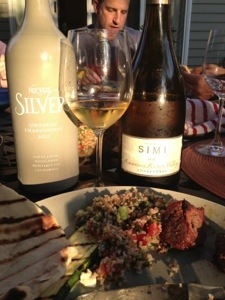 2011 Mer Soleil Chardonnay Silver Unoaked: Retail $25. As I have mentioned before, I am rather shallow–I bought this wine because of the bottle (and that it claimed to be an unoaked Chardonnay). One of the fruitier noses I have experienced in a while–melon and honeydew with a bit of pineapple. Good acid on the palate and an admirable finish. The extra time in my cellar seems to have done it well. Very Good. 88-90 Points. 2004 Domaine Bernard Moreau & Fils Chassagne-Montrachet 1er Cru Les Champs-Gain: Retail $60. 100% Chardonnay. It was a rather dubious anniversary for me, so I grabbed what I hoped would be a pretty good bottle. I have had a few of these, some great, a couple stinkers. The pale yellow was a welcomed sight, tipping its hand that this would be one of the good ones, perhaps the best of them all. A classic white Burgundy nose with lemon, vanilla, and just a hint of oak. Pure gold on the palate with seamless depth, wonderful flavors, and an enduring finish. Whoa. No wait, it’s worth two: Whoa. Outstanding. 90-92 Points. 2008 Skewis Pinot Noir Anderson: Retail $50. When I looked up on Cellar Tracker for a nice bottle for #PinotClock, I noticed that the users of Cellar Tracker feel that many of the 2008 Skewis wines should have been consumed by 2013. Dubious (my experience with Hank Skewis’ wines has been close to the opposite–they tend to age very well), I grabbed a bottle and headed upstairs–as I figured, this wine is doing just fine: cherry, anise and a hint of cassis, great balance with fruit up front and vibrant acidity on the back end. Outstanding. 91-93 Points. 2009 Villa Petriolo Chianti Rosae Mnemosis: Retail $25. 100% Sangiovese. More of a modern style wine with really juicy fruit and just a touch of tannin on the finish. This is a fantastic pizza/pasta wine, perhaps one of the better ones I have had. And there is enough depth to prevent your wine geek brother in law from kvetching about not serving the good stuff. Very Good to Outstanding. 88-90 Points. WINE OF THE WEEK: Looking back over this week, it is clear that I am keeping up my New Year’s Resolution to drink more Italian wine (2 bottles this week!) and both were very good, which will encourage me to keep following the resolution (still going strong in April!). France remains the go-to country, however, so when I had an anniversary of sorts, there was no doubt I was going to grab a Bourgogne. The 2004 Domaine Bernard Moreau & Fils Chassagne-Montrachet 1er Cru Les Champs-Gain certainly came through, which is good since my higher quality white Burgundies are dwindling and will likely not be replaced anytime soon (although if the Euro continues to fall…). It is also rather clear that the West Coast of this country is becoming my go-to region for Pinot Noir. Yes, that is a blasphemous statement, but as with the whites, Burgundy is just too expensive. The 2008 Skewis Pinot Noir Anderson was delightful and I am looking forward to another bottle of it, but this month’s Wine of the Week is the 2004 Argyle Pinot Noir Nuthouse Reserve Series. Perhaps it was the taboo nature of its consumption, or that I drank it alone on the couch watching the NCAA tournament, free to scream or cry at will as my bracket slowly busted (remember context is everything in wine), but this was an incredible bottle. 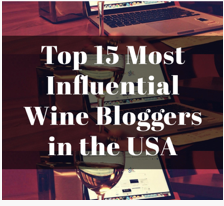 This entry was posted in Chardonnay, GSM, Pinot Noir, Rhône Blends, Sangiovese, Wine and tagged Argyle Pinot Noir, Argyle Pinot Noir Nuthouse, berry fruit, California wine, cellar tracker, Chardonnay, Pinot Noir, Skewis Pinot Noir Anderson. Bookmark the permalink. One pairing tip that you may want to give a try is not to pair wines having noticeable acidity with tomato sauce. This is because tomatoes have a natural acidic note which would only be increased by the wine’s, generally resulting in a not ideal pairing. Oh no, I know. I just thought it was going to be fruity rather than acidic. It was my first time with the wine–will know better next time!